Can William Penn sustain the addition of 7 sports? The sports landscape at William Penn High School is beginning to change, as the school looks to add sports. The sports landscape at William Penn High School could be on the verge of a major overhaul. Five sports were reinstated this fall and several more could be coming in the near future, school athletic director Ron Coursey said. Boys' and girls' cross country, boys’ soccer and girls’ soccer, and competitive cheer all returned during the fall academic semester on either a club or junior varsity level. Coursey said the school is aiming to add softball and baseball this spring in a similar capacity. Talks of a full-fledged return to varsity athletics for the seven sports is preliminary, district spokeswoman Erin James said. The school board must approve of such a move for each sport, James said. She added that each sport has a separate budget that must be "sustainable and funded." A look at how much it costs other area schools to run those sports gives you an idea of William Penn's challenge. During the 2014-15 academic year, Spring Grove Area High School spent $10,432.83 to run its junior varsity baseball program, according to the 2014-15 Athletic Opportunities Report, which is filed every year by Pennsylvania public high schools to the state's Department of Education. The Rockets' baseball program in its entirety — all expenses surrounding their varsity and junior varsity programs — cost nearly $31,000 that season. Of the six schools studied by GameTimePA.com, that was on the high end in 2014-15, however. Dover Area High School spent just under $14,791.55 on its baseball program, South Western High School spent $13,559.03 and Harrisburg High School spent $15,885.57. Money spent on specific sports programs varies depending on different factors on a year-to-year basis. Such circumstances can lead to fluctuations in how much a program spends in a given year. "It's dependent on a lot of different things," said Eastern York Athletic Director Don Knaub. "Your postseason success, your transportation costs, if you had new uniforms. Every school and every year is going to be different." William Penn's approach to generating funds will be two-fold, Coursey said, with the school board allocating money to the programs and William Penn reaching out to the community for assistance. York city's 2016-17 academic budget is $128 million. "Because we are a district currently in a recovery plan, part of my job has been to reach out to community members," Coursey said. "Local businesses, local nonprofits and see who is willing to partner with us to help. Whether it be financially or through volunteer efforts or anything that's going to help us rebuild these programs." Coursey said the "poster child" for community involvement with William Penn athletics is the York Revolution, who offered PeoplesBank Park as an occasional home field for Bearcats baseball. Coursey said the Bearcats would have access to the field and dugouts on gameday. He added that Menzer will grant the team access to batting cages and pitching mounds underneath PeoplesBank Park if those facilities aren’t in use by the minor league team. "He's a baseball guy,” Coursey said of Menzer. "He wants to see baseball back at York High and York city." York City Little League could also help. 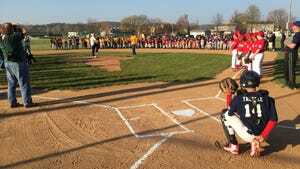 York City Little League President Philip Woods said the organization is using its social media platforms and connections within the local community to generate interest and support for the return of William Penn baseball. Woods also said York City Little League could help in the restoration of the baseball facility at Small Field. Woods said one factor that could aid the push would be if York City Little League has access to the facility as well, in what could be considered a joint partnership. Woods said such a scenario is something the two entities could "consider and discuss." Coursey said William Penn looks at York City Little League as a feeder system into the high school program. "We've prepared kids to play baseball. But then they have no outlets outside of American Legion," Woods said. He then asked rhetorically, from a player's perspective: "'Why am I putting everything into playing this when I can't showcase myself past the age of 15?'" For the soccer programs, both coaches — Soji Otuyelu for the boys and Alexis Lindo for the girls — are volunteer coaches from the community. Soji, who lives in the York Suburban school district, said he's been working with the boys' program since May. He said the need for quality volunteer coaches are vital for a startup program, and that he wants to help the kids cultivate a love for soccer. All the aforementioned programs were part of Bearcats athletics. But the school dropped them over the past 10 years as it cut its budget. Coursey said all the programs will be reintroduced initially as club or junior varsity sports so the school can gauge interest, talent level, and teach athletes the fundamentals of the game. There were 45 players in the two soccer programs this past fall — 23 boys and 18 girls — according to Coursey. There were five cross country runners total and 17 female student-athletes in the competitive cheer program, Coursey said. Coursey said that during a recent softball meeting, 45 prospective players attended. He added that William Penn softball would play its home games at Hannah Penn Middle School in York city. While boys' and girls' soccer would play at Small Field, the cross country team would call portions of the Heritage Rail Trail Park its home course. "The kids are hungry for it," Coursey said. Three programs the school considered resurrecting but didn't receive enough interest for were wrestling and boys' and girls' tennis. Instead, co-ops are in place with other schools for William Penn student-athletes interested in participating yet can't at their own school: wrestling with York County Tech, tennis with York Country Day. Victoria Jean-Baptiste, a member of the competitive cheer team at William Penn, said she's never been part of a competitive sports team, making this year a new experience for her. How do they stack up? GameTimePA.com compared six schools of similar size or setting as William Penn – Dover, Spring Grove, South Western, New Oxford, Reading and J.P. McCaskey – to evaluate potential costs of reintroducing such programs. Total costs for these programs include travel, uniforms, supplies and equipment, facilities, coaches compensation and other expenditures. Below is a breakdown of the annual expenditures from each school for the nine sports William Penn is looking to add. The information was compiled from the 2014-15 School Year Athletic Opportunities Report, which is an annual report that schools submit to the department of education with participation numbers and athletic program costs.